Base metals are any nonferrous (they contain no iron) metals that are neither precious metals nor noble metals. The most common base metals are copper, lead, nickel, tin, aluminum, and zinc. 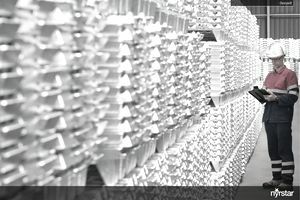 Base metals are more common and more readily extracted than precious metals, which include gold, silver, platinum, and palladium. Noble metals, some of which also are precious, are unlike base metals because they resist oxidation. Some common examples of noble metals include silver, gold, osmium, iridium, and rhodium. Pure base metals oxidize relatively easily. Except for copper, they all react with hydrochloric acid to form hydrogen gas. Base metals also are less expensive than their counterpart precious metals because they are so much more common. Base metals are used in a wide variety of applications. Copper is commonly used in electrical wiring because of its high ductility and conductivity. Its high ductility means it easily can be stretched thin without losing strength. Copper also is good for wiring since it is the one base metal that resists oxidation and does not corrode as easily. Lead has proven to be a reliable source for batteries, and nickel often is used to strengthen and harden metal alloys, including stainless steel. Base metals also are used frequently to coat other metals. For example, zinc is used to coat galvanized steel. While base metals aren't considered to be as valuable as their precious metal counterparts, they do still have value because of their practical uses. According to Investopedia, economists frequently use copper as an indicator for global economic forecasts because of its widespread use in construction. If there's lower demand for copper, that means construction is down, which could be a sign of an economic downturn. If the demand for copper is up, the opposite would be true. Aluminum is the third most abundant element in the earth's crust (trailing only oxygen and silicon) and it does the highest volume of trading on the London Metal Exchange (LME). Extremely malleable, which means it can be pressed into sheets, aluminum has many uses, particularly in making containers for food or other products. Metals traded on the LME are contracts for delivery 90 days forward. The third most actively traded base metal on the LME is zinc, trailing only copper and aluminum. In addition to being used to coat galvanized steel, zinc is a common ingredient in coins, is frequently used in die-casting, and has many applications in construction, including pipes and roofing.